Mr Bike teaches you street smarts and cycling confidence. June 17, 2006  2:00 to 2:30 p.m.
Mr Bike turns schlepping shoppers into canny, cadenced consumers. He'll reveal why you don't need leanness, lycra, or light speed to soar to the store on your Schwinn. Learn how to carry loads of stuff, breeze through traffic, and thwart thievesall from Mr Bike, a certified bicycling instructor and author of the popular paperback, Urban Bikers Tricks & Tips (for sale during the event). Free. Tuesday February 21, 2006  7:00 - 8:00 p.m.
Mr Bike joins a panel of other sustainable-living enthusiasts to offer simple tips for integrating more bicycling into your everyday life. Admission fee. Friday January 20, 2006  7:00 - 8:00 a.m.
Join Mr Bike and the Federation staff for hot chocolate, cheesecake, and other treats as rewards for bike commuting in the winter. Bike commuters only. Sunday January 15, 2006  4:00 - 6:00 p.m.
Mr Bike and the Bike Winterites give you all the tricks & tips you need to: dress warm & cheap; handle your bike in snow & ice; and keep the ride runnin after onslaughts of salt n sleet. Click here for Mr Bikes list of sources for winter-cycling clothing and accessories. Friday December 30, 2005  4:00 - 5:30 p.m.
Saturday December 17, 2005  Noon - 5:00 p.m.
Mr Bike transforms into Santa Bike for this annual cocktailing cavalcade to combat consumerism. Open to Santas, elves, and reindeer only. Click here for Santa Devin's photos of the Rampage. Thursday December 15, 2005  5:00 - 5:30 p.m.
Bike Traffic Live host Eve Jennings talks with Mr Bike about blissful blizzard biking. Call in to 312/738-1060 with your questions! Click here for an audiovisual recording of the interview (requires Windows Media Player). Saturday November 5, 2005  3:00 - 5:00 p.m.
Mr Bike and the Bike Winterites give you all the tricks & tips you need to: dress warm & cheap; handle your bike in snow & ice; and keep the ride runnin after onslaughts of salt n sleet. Meet buddies to bike with, and ogle hot bodies modeling fetching yet practical underwear. All ages welcome. Bike parking available. Click here for Mr Bikes list of sources for winter-cycling clothing and accessories. Sponsored by the Chicagoland Bicycle Federation and Patagonia. Click here for Bob Matter's photos of the event. Mr Bike gives BIBC members and guests many of the tricks & tips needed to: dress warm & cheap; handle your bike in snow & ice; and keep the ride runnin after onslaughts of salt n sleet. Click here for Mr Bikes list of sources for winter-cycling clothing and accessories. Free and open to the public. Sponsored by the Chicagoland Bicycle Federation. Mr Bike acquaints retailers with the revised edition of his book Urban Bikers Tricks & Tips, and gets the scoops on the bike industrys latest products. Registration required. Saturday, July 16, 2005  11 a.m. - 3 p.m.
Mr Bike teaches a basic, four-hour class on fixing and maintaining your bike. Sponsored by the Bike School of the Chicagoland Bicycle Federation. Registration required. Mr Bike teaches classes on traffic cycling and dating & socializing by bike. Registration required. Mr Bike uncovers his own demonstration for riding raw during Chicago's second annual installment of this worldwide event. Free. Click here for Mr Bike's naked-riding tips. Mr Bike presents on his work with the Chicagoland Bicycle Federation to create one-day class that shows the average person how to get comfortable with bicycling in traffic and become proficient in utility cycling. Registration required. Click here to see a photo of Mr Bike presenting at the conference. Wednesday February 23, 2005  7:45 - 8:45 p.m.
Mr Bike gives AHBA members many of the tricks & tips needed to: dress warm & cheap; handle your bike in snow & ice; and keep the ride runnin after onslaughts of salt n sleet. Click here for Mr Bikes list of sources for winter-cycling clothing and accessories. Ice Ride on Lake Michigan  North Avenue Beach House, Chicago  Chases Calendar of Events calls the first day of February a day to be adventurous and self-reliant. Slide into an adventure in ice biking with Mr Bike and others as they take to the lake for pyrotechnics, inner-ear tests, and to celebrate Robinson Crusoe Day. Bring additional layers for standing in place, and prepare for slick times. Drinks and/or eats afterward. Special demo: Avoiding alcohol-related bicycling injuries. Bike Ride: Santa Cycle Rampage  Meet at Twisted Spoke, 501 N. Ogden Ave., Chicago IL  www.bikewinter.org and www.santarchy.com  Mr Bike transforms into Santa Bike for this annual cocktailing cavalcade to combat consumerism. Open to Santas, elves, and reindeer only.  Click on these links to see photos from airzound, Josh, Mike, and Chris.  Click here for a full report on the Rampage! 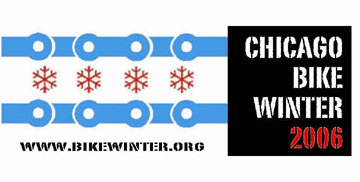 Free Bike Winter Clinic  Slush Fun: Winter Bicycling Tricks & Tips  Quenchers Saloon, 2401 N. Western Ave. (at Fullerton), Chicago  Quenchers phone: 773/276-9730  Info from a human: 312/427-3325 x229  Info from a machine: www.bikewinter.org  Mr Bike and the Bike Winterites give you all the tricks & tips you need to: dress warm & cheap; handle your bike in snow & ice; and keep the ride runnin after onslaughts of salt n sleet. Meet buddies to bike with, and ogle hot bodies modeling fetching yet practical underwear. All ages welcome. Bike parking available. Click here for Mr Bikes list of sources for winter-cycling clothing and accessories.  Free raffle! Winter-accessory prizes!  Sponsored by the Chicagoland Bicycle Federation and Patagonia. Seminar: League Cycling Instructor Certification  Chicagoland Bicycle Federation, 650 S. Clark St., Chicago IL  312/424-3325 x244  www.biketraffic.org  Mr Bike team-teaches in a three-day seminar in which new bicycling instructors get their colors, becoming certified instructors in the BikeEd program of the League of American Bicyclists (www.bikeleague.org). Open to registered LCI candidates only. Seminar: Getting the Most from Your Bike  Chicagoland Bicycle Federation, 650 S. Clark St., Chicago IL  312/424-3325 x224  www.biketraffic.org  Mr Bike lends support to the participants of Bicycling magazines BikeTown USA program by teaching them how to better use the bikes given to them in the program. Topics: Getting comfortable with traffic; simple maintenance; how to carry stuff; finding more time to bike; and Q&A.  Open to BikeTown USA participants only.